The Patagonia Men’s Rio Gallegos Fishing Wader is a Patagonia men’s sized fishing wader that is made with an H2No Performance Standard polyester microfiber shell that contains a proprietary waterproof and breathable barrier and a NanoSphere DWR finish that is puncture resistant and durable and does not contain any added layers or additional weight which makes this men’s regular fishing wader the perfect wader for your next fly-fishing outing. The Patagonia Men’s Rio Gallegos Fishing Wader is made with single seam construction that completely eliminates seams from the highest wear points on the inside of the legs and has an interior welded TPU-waterproof zippered pocket. This men’s regular fishing wader also features hand warmer pockets with water-resistant zippers for fast access to tippets, nippers, floatant, and other fly-fishing gear to easily utilize while you are fly-fishing. The Patagonia Men’s Rio Gallegos Fishing Wader also comes with waist-mounted EZ-Lock suspenders for fast conversion from chest to waist high waders to provide fast relief without having to remove your fishing jacket. These suspenders are also made with a TPU slide-and-lock design on the front and back for added safety when deep water wading and the suspenders also comes with a full elastic back that provides fly-fisherman with all day comfort. The Patagonia Men’s Rio Gallegos Fishing Wader is also designed with anatomically curved knees that have removable neoprene knee pads and anatomically designed left and right booties with abrasion resistant soles that are designed with 3mm neoprene that are lined with merino wool for added warmth and breathability. A laser-cut Hypalon utility keeper is also included with this men’s regular fishing wader for fast access to tools, nippers, ect…. and a field repair kit is also included, so make sure to check out this men’s Rio Gallegos regular fishing wader. A new generation of quality fly fishing waders from Patagonia, the new Rio Gallegos Waders that will not dissapoint. The Rio Gallegos are the toughest, most puncture-resistant waterproof/breathable wader on the planet. They combine the finest level of durability while offering a new level of comfort and convenience. In other words, the ultimate wader. We started by strategically placing varying weights of our proprietary H2No® Performance Standard polyester microfiber fabric package with a waterproof/breathable barrier according to specific breathability or toughness needs. The result? Max durability and flexibility without resorting to excessive, heavy, sweat-trapping layers. Our revolutionary merino wool grid-lined neoprene booties wick perspiration and create guilt-inducing levels of foot comfort. The 3mm neoprene maintains the warmth of 5mm neoprene but with better breathability. Our innovative internal suspension system allows easy conversion to waist height and - this is critical - quick relief without having to remove your jacket or fight sticky zippers. Upper exterior glued-in, water-repellent zip pocket at chest provides ample storage for quick access to tippets, nippers and lip balm. An interior, clear-welded TPU pocket provides waterproof security for cell phone, camera and keys. More features: sculpted upper for reduced drag in heavy currents, anatomically curved knees with removable knee pads, built-in fabric gravel guards with abrasion-resistant scuff zones and high-filtration mesh drain strip, a quick-release DuraFlex® Stealth-V buckle for an adjustable fit and, to avoid line catch, concealed stainless-steel locking boot hooks. Exterior reinforcement tape on interior leg and crotch provides unsurpassed abrasion resistance where it’s needed most. High-filtration polyester mesh drainage strip is 100% recycled. Field repair kit included. 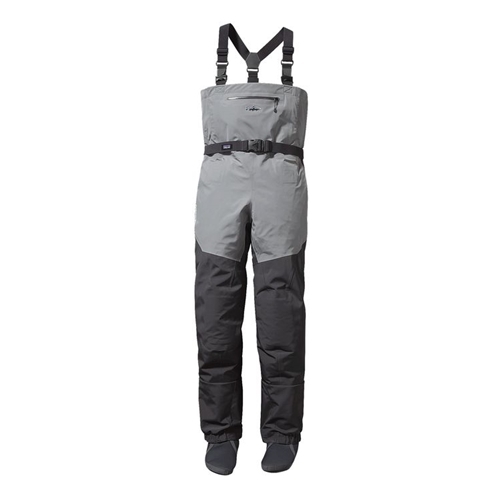 on 4/2/2019 These waders are great! After a couple of uses I'm very impressed. The versatility of the Rio Gallegos is great, and the features plentiful. The knee pads were something I wasn't interested in at first, but I'm glad I have them! They seem durable, I did lots of rock scrambling and hiking with no issues. And of course, they kept me warm and dry! First off, these fit me perfectly in a large regular and I'm 5'10 200lbs with a size 13 shoe. I love how comfortable these waders feel and that they are a little more roomy than the Simms G3 making them my go to winter waders. They also breath very well and seem to be extremely well built and resilient. Hat's off to Patagonia for their excellence in quality crafmanship. Oh yeah and the merino wool lined booties are just heavenly.